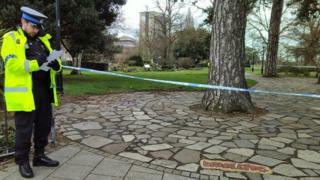 Two more people have been arrested in connection with a stabbing in a Southampton park. A 35-year-old man remains in hospital with serious injuries after he was stabbed in the back in East Park shortly before 20:00 GMT on Monday. Two men, aged 27 and 24, have been arrested on suspicion of conspiring to commit grievous bodily harm. A woman and two men arrested on suspicion of attempted murder have been released pending further inquiries. Police have urged anyone who saw the attack, which is believed to have taken place near the Titanic Engineers' Memorial, to come forward. Chf Insp Phil Lamb said: "We understand that incidents of this kind can cause concern amongst those who live and work in Southampton. "At this time, we believe this was a targeted, drug related attack and we do not believe there is a risk to the wider public."